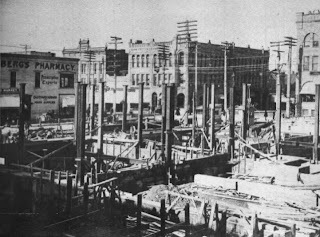 Construction site with large steel columns and foundation walls, 100 years ago. If you look real closely, there's a horse cart parked by the old Bergs Pharmacy across what is now called State Street. The view across Holly has changed also. Click on image for larger version. Sometime around 2006, 2007 someone can say that Bellingham's main YMCA building turns 100. It depends on whether one counts from start of construction, grand opening or what ever. The building didn't start as a YMCA. It was an office building. At first, it was called The Exchange Building. Back then, the Y was across Holly Street in a building that later became the Odd Fellows. That place still stands as apartments today. 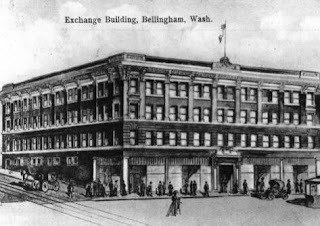 Before becoming a Y, the Exchange Building was offices and stores. State Street was called Elk Street back then. Notice the horse carriage headed up Holly St.
Next the Exchange Building became "Hotel Henry." That was in the mid 1920s. The 1940s saw that building become a Y. From what I read, the building was donated, to a large extent, for the Y. Hotel seen from alley before gym was added. Image taken from an inventory book that was produced around 1927. The gym and pool was added around 1951. There has been many remodeling projects over the years; including quite a few recent projects. They are always doing something. After the year 2000, a second climbing wall was added to the south side. Newest climbing wall is 65 feet tall. First climbing wall was added during the mid 1990s. On March 6, 2006, Bellingham Herald did a historic feature on the building. That's still available in archives. There are quite a few old photos around. These images are two of my favorite that I scanned while working on the custodial crew.